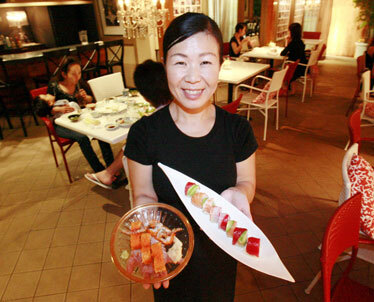 Keiko Watson serves Wasabi Bistro's dishes of the soft-shell crab roll and rainbow roll. Some addictions are more socially acceptable than others. As much as health experts have been telling us that workaholism is a bad thing, we've been doing it so long that it will take a while for the message to sink in. The energy, drive and enthusiasm that go with the 24/7 work ethic are generally perceived as positive forces preferred over workplace sloth. In light of such sentiment, there's no need for a Restaurateur's Anonymous to materialize, but if ever there were a candidate, Kumi Iseki might be it. The woman loves to open restaurants, which she's done from Kapolei to Kahala and abroad. I thought we had seen the last of Wasabi Bistro when she partnered with the Nadaman company of Japan to transfrom the restaurant into the more traditional, upscale Japanese restaurant Wasabi and Nadaman, but as it turns out, she wasn't done with the more casual, sometimes quirky style of Wasabi Bistro. The restaurant has been resurrected in Waikiki, tucked in the back of the charming Breakers Hotel, which I adore for its old Hawaii vibe of quiet low-rise apartments surrounding a courtyard and pool. If I had land and money, this is exactly how I'd want my home to be. The indoor-outdoor aspect of the property is echoed with Wasabi Bistro's minimalist "Gilligan's Island" meets Ikea aesthetic that manages to be casual, comfortable, contemporary, chic and conducive to relaxation. Inside this cocoon, one unfamiliar with the area would have no idea that just one block over is the glitzier, noisier Waikiki Beach Walk development. Sigh and settle in for sake and sushi. Chances are, you'll want to linger for a long while, and this is the kind of place where you're never short of options. Depending on your mood, appetite and state of your game in stock-market roulette, you could limit yourself to nibbling on a handful of $5 to $7 appetizers or go for the serious entrees and sets. Lunch at Wasabi Bistro brings an array of sushi, izakaya-style starters and teishoku specialties ranging from your basic chicken katsu ($11.50) to thick -- I'd say it's a half-pound -- hamburger steak ($24.50) covered in a wine-based, sweet-sour tonkatsu sauce. YOU CAN'T visit Wasabi Bistro without sampling a couple of its signature dishes, though the mayo hater's club could probably take a pass on the creamy likes of the Wasabi No. 1 Special ($9.75), a sort of baked California roll featuring two small mounds of surimi, avocado and white fish enveloped in a thick, unagi and mirin-sweetened house sauce. Another of her signatures is the baked scallop special ($12.75) which is mostly rice, topped by a few pieces of scallops and mushrooms, layered with bonito flakes and another creamy, spicy sauce. As much as I try to avoid rice (no sugar-releasing carbs for me), I reached for second and third spoonfuls of this dish. Those wishing to share a platter of sushi might start with the Wasabi Sushi Roll Platter ($18.75) with a half roll each of the restaurant's most popular rolls: the Rainbow, shrimp tempura and spicy Dynamite. Light and crisp shrimp and vegetable tempura can be ordered as part of a teishoku dinner ($23.50), or if you're short on cash and just want a taste, ordered a la carte at $7.25 for three pieces of shrimp or $5.50 for vegetables. Butterfish misoyaki ($27.50) was dense and overcooked, so yes, I'm afraid I have been spoiled by Nobu, though at Nobu you will pay more for the black cod. One of the more unusual dinner sets here is the East-West Wasabi dinner special ($32.25). It starts out simply enough with the traditional tsukemono, miso soup, sunomono, tofu salad and sushi, plus the Wasabi No. 1 Special, marinated fried chicken tatsuta-age. Its nod to the West is a crab sandwich on white bread. It's a lot of food, but I did see someone eat it all. I would rather create my own set.